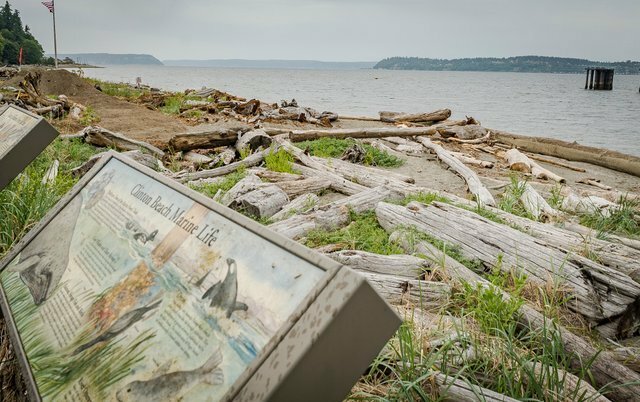 What does a trip to a Whidbey Island beach mean to you? Do you think of wriggling your toes in the sand, of poking through driftwood looking for treasures, or wading into the chilly water? Do you enjoy walking along the shore or throwing sticks out into the waves for your dog to retrieve? Or perhaps your joy comes from a sitting on a log sketching the scene around you, reading, or simply contemplating life where the land and the water meet. Trenor’s gym buddy, Frank Ruggiero, is an experienced fisherman, and when he offered to share his knowledge, Trenor took him up on it. The two men met at a beach near Keystone. Ruggiero, who was rehabbing from a spinal injury that left him relying on crutches, got his fishing pole out, leaned his crutches against the side of his pickup, lowered himself to the ground, and crawled to the water’s edge. 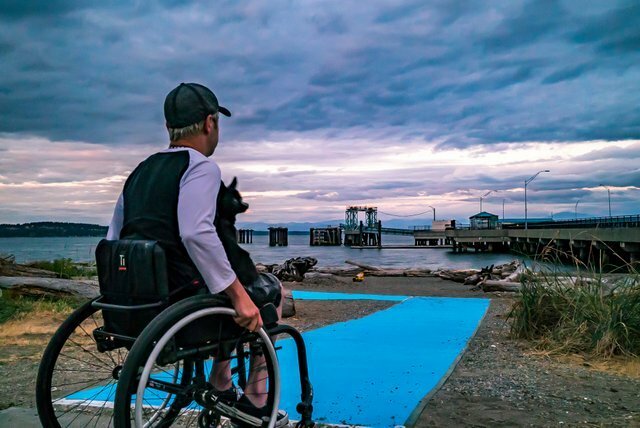 With Ruggiero sitting on the sand instructing him, Trenor got a lesson in fishing and in what life is like when you can’t walk where you want to go. 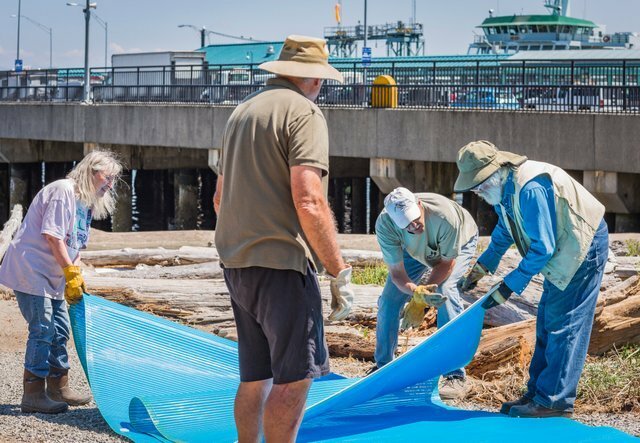 Research into how other beach communities have handled this issue led Trenor to make a trip to Boundary Bay Provincial Park in British Columbia. There, the wide sandy beach beckons people out to the water, but the majority of them, able-bodied or not, choose to get from the parking lot to the beach by walking or rolling on a thick blue mat that stretches across the sand. It is like a plastic boardwalk—firm and solid. Folks in wheelchairs, parents pushing strollers, kids pulling wagons, seniors with canes, and young, agile teenagers all make their way down to the shore on it. AccessMat® accessibility mats have changed the way most park visitors enjoy the beach. And, in fact, mats like them are used up and down the East Coast, in Europe, and in South America to provide a path for everyone to cross the sand. 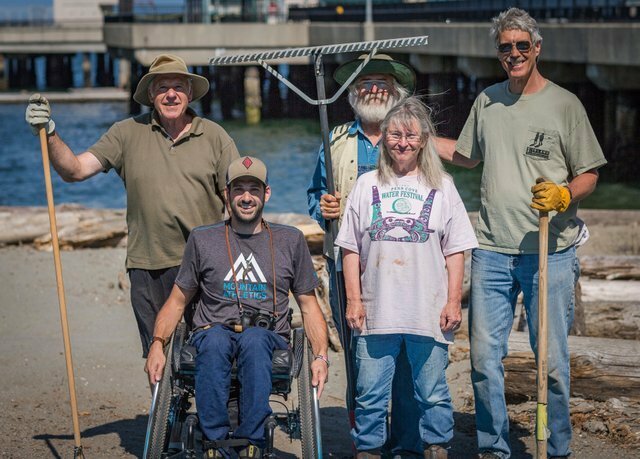 Once Trenor and IBA learned that there was a solution, they looked for a beach where other obstacles—like too steep a slope, too narrow or long a trail from the parking area to the sand, or lack of space for disabled parking—wouldn’t complicate accessibility. 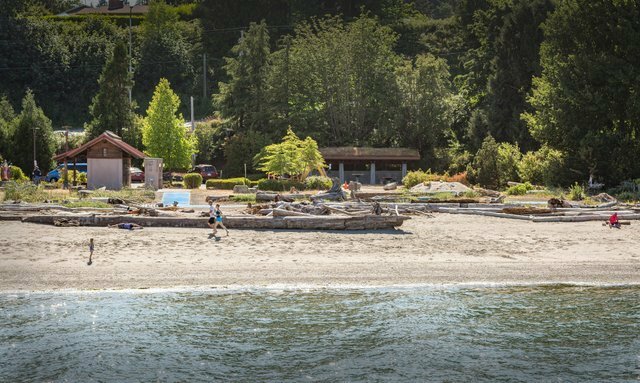 There were a few candidates, but Clinton Beach Park had the added advantage of being easy to get to for both islanders and visitors who may not know about many of the other public beaches. A beach popular with summer crabbers and many who walk their dogs and bring their kids to play, Clinton Beach Park is at the northwest corner of the ferry landing. The park draws locals and visitors with its picnic tables under a “living roof,” a gazebo with bathrooms, and art by local artists. It offered a good location, a manageable size, and a relatively flat shoreline. But it quickly became clear that, if disabled people were going to come to this beach, they would need a better parking situation. That would mean expanding the small parking lot to make room for more disabled parking spots. Another issue was the driftwood that created a barrier between the concrete and the sand. The environmental impact of altering the parking lot and of moving the logs that had piled up over the years needed to be considered. Permits were required for all of this work and, of course, money was needed. Clinton Beach Park is the property of the Port of South Whidbey, whose mission is “to enhance the economic well-being of the community and improve public access to marine areas while respecting the unique rural character and environment of South Whidbey Island.” Trenor’s first step was to ask the port for its cooperation and for financial help to make the project a reality. 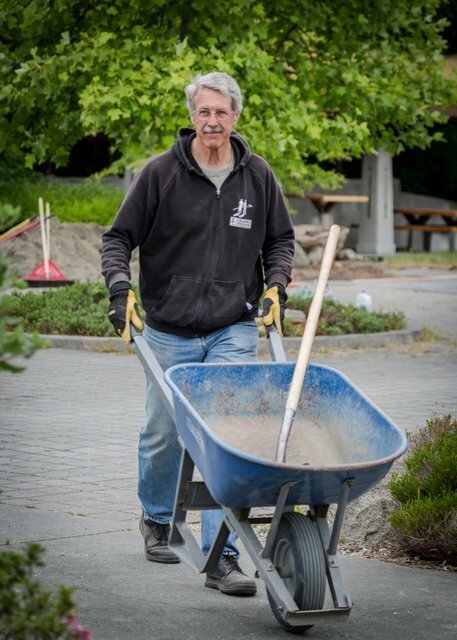 The project is not yet complete, but thanks to many hands and strong backs, the parking lot has been repaved to create two ADA-compliant parking spots, driftwood has been moved, and plants have been relocated. The trail to the sand has been delineated and the first section of access matting has been laid. Last week, Ryan Murphy, an adult confined to a wheelchair, was able to go to the beach for the first time since he was 6 years old. Murphy lives across the water and visits his parents on the island every weekend. The family has a home with beach access, but not the kind of access that Ryan can take advantage of. 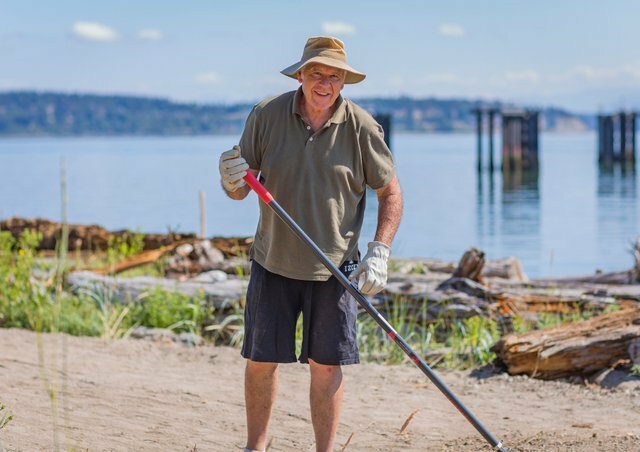 Now, there’s a beach on Whidbey where Murphy feels welcome. IBA needs funds to extend the access mats all the way to the sand. They’ve created a Go Fund Me campaign, to which you can contribute by clicking here. Deborah Nedelman, Ph.D., M.F.A., has been married to Mel Trenor for 43 years. After retiring from her first career as a clinical psychologist and raising two children, she moved to the island where she devotes herself to working with words. A published author, she writes, edits, runs writing groups, coaches writers, and is a member of the WLM team. Kyle Richardson is a commercial photographer who specialized in photographing automobiles, still-lifes, and individuals north of Los Angeles. He built and managed a 6,000 square-foot studio there that supported a wide variety of still imaging, video production, and interactive and print design. 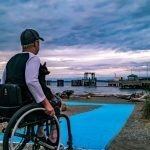 He relocated to Whidbey Island for health reasons and is starting to take on small creative projects that he can do from the wheelchair here in the Pacific Northwest. Our family has benefitted from your dedication to make this project happen. Our son Ryan now has unprecedented access. He was thrilled to try it out the other day when he came off the ferry. We look forward to using it often. Thanks so much for your attention to the needs of this population. Wonderful article. Congratulations to Mel Trenor and his team from I.B.A. And the south Whidbey port district for making this happen. We can expand this to other beaches in Island County and we should. What the article doesn’t mention is that this is the first use of these mats in Washington. I think that will soon change as other locations are developed. It’s a great solution.